Planning an Amish wedding for a few hundred guests, and want to make sure the special day goes off without a hitch? You’ve never found yourself in that situation, you say? Well, if you ever did, you might do well to pick up a copy of Das Hochzeit Büchlein: A Wedding Preparation Booklet. This handy guide was produced by members of the Lancaster County Amish community. It’s a collection of practical tips on things like preparing food, invitations, logistics and more, “for weddings with about 350 guests”. As you’d expect, there are a lot of details to attend to when organizing an Amish wedding. You may need to arrange things like commemorative wedding pens or even a wedding trailer or “wedding house” for the event. Here are five of my favorite Amish wedding tips from Das Hochzeit Büchlein. If you find this interesting, I’ll share more in another post. Floor Support: Things for men to do on wedding day – Ensure that floors will not collapse in wedding area (hollow concrete blocks are often what breaks). Extra props may be needed in basement and below any area where groups of people fill rooms to standing room only. English Guests: If you have English people there at mealtime, put them all in a separate table to eat down in the basement or out of the way. Have someone wait on them, and also have those persons “take them around” until they leave. Also: If they do not know German it is usually appreciated to at least be told the text (during the wedding). Crying Babies: Assign several women to be baby-sitters for the immediate family the day of the wedding. Like in the forenoon, who loves having the sermon disturbed by a crying baby who could be entertained upstairs? And also during meals, the family needs help. Water: Water Porter – The most needed thing in a wedding seems to be water. Not so much a concern, but it is nice to be able to have access to a simple drink. Ones who travel are less in need of stopping for coffee if some is served to early comers, but giving water instead of coffee is good. By supplying water to guests in the afternoon, especially ones playing volleyball, the overall health is better. Especially for ones with many weddings. Food Prep: As you’d expect there is plenty related to preparing and serving the huge wedding day meal(s), including sections “For the Potato People” (“There should be 4 3/4 buckets of potatoes peeled in the morning”), on Celery (“Some people buy it a little early and cover it and set it aside, maybe about a week. It isn’t so green & tastes better”), and a Bulk Food Store shopping list (items include 25 dozen Eggs, 1 case Velveeta Cheese, and 50 pies). Weddings vary a lot from community to community and group to group. The Lancaster type weddings are very different from Holmes Co., starting with the season. While most PA weddings are in the fall or winter, ours lean more towards spring, early summer, and early fall. #1 — PA weddings ceremonies & receptions are at the bride’s home. Here the service will be at a neighbor’s home & the reception at the bride’s home. Most receptions (if not all) are held in a “shop” or multi-purpose building. Since it’s generally a one story building to begin with, extra supports are not needed. #2 — It seems as though non-Amish guests are more common in our weddings than in PA. There may be enough to fill a table or two, but there is no effort made to put them “out of the way.” Since non-Amish relatives are usually seated with the Amish relatives, there may be non-Amish people mixed in with the Amish. #3 & #4 — since relatives & close friends are invited as “help” and it’s an honor to help at a wedding, there are all kinds of assigned positions ranging from cooks, servers, babysitters, dishwashers, water boys & girls, coffee makers & servers, gift receivers, etc. so the babysitting position often falls on girls old enough to be responsibly but not old enough to be with the youth. Water servers are usually boys & girls around 12-15 years old. On #2, I got a comment from a reader surprised about it, I think she found it offensive. And I can see by the way it is worded, it probably sounds like they are trying to keep the English “out of the way”. On #5, you can only see 3 or 4 Celery-related items in the photo I posted above, but there were actually 6 in that chart. So, if you are going to a Lancaster wedding and like celery, get excited. Erik, I can see how #2 could have been offensive! As soon as I read it, I thought, “Well, that’s kind of a rude way to put it!” How would I feel if I was reading a Mennonite or _____ fill in your blank___ wedding planning book and it suggested seating the Amish in the basement so we are out of the way? I’m trusting it was not meant quite like that, but still. And good point on the language. If I were attending a wedding where everyone spoke a different language that I didn’t, I’d want to be seated with folks I could visit with. Talking about it at home, though, we could remember being at different weddings in PA where the non-Amish guests were seated together but NOT in the basement or out of the way place. I asked my son, Mark, who is a part of the Belle Center, Ohio community. I read him Holmes County, Ohio Mark’s comments and he concurred. He did comment that at Belle Center, only Amish may have parts in the weddings. Beachy Amish and Mennonite relatives may not have a part as far as table waiters, hostlers, etc. Most Holmes County weddings that Mark knows about usually don’t have an evening meal. At Belle Center, an evenings meal is served and all of the community’s young folks are invited. The boys sit across the table from the girls. Usually at the evening meal hot sandwiches, chicken and noodles, and a relish plate are served. Any Amish excommunicated are seated and served at the tables with the English guests. You Mark is New Order and I am Old Order. 🙂 His comments sound like he is describing Holmes Co. New Order weddings, which are somewhat different from ours. (As they don’t have an evening meal, where we do.) It’s interesting to attend weddings in various different settings and see how they might be the same or different. I thought this was a great post. Mark, I was happy to read your comment also. One of my favorite books growing up was Stephen Scott’s “An Amish Wedding”; I loved hearing about all the details of different special occasions in Old Order communities, as well as how things differed by community. It would be interesting to read an updated version of that book if one is ever written–I’d sure volunteer to do the research! Emily I’ve also really enjoyed Steve’s little books on many Amish topics – buggies, Plain clothing, etc. Since most of them were published 15-20+ years ago, it’s true they would be ripe for updates. Unfortunately he’s not around anymore to do it, but maybe someone will. Erik, I have checked the new printings out. They appear to be the same content, just updated cover photos. Why don’t YOU do an updated version? Seriously! There would be a market for that, I’m sure. 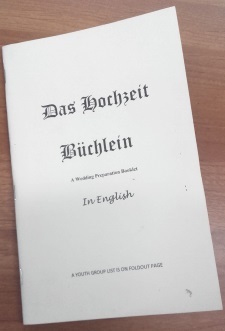 The correct translation for Das Hochzeit Buechlein into english is The Wedding Booklet. 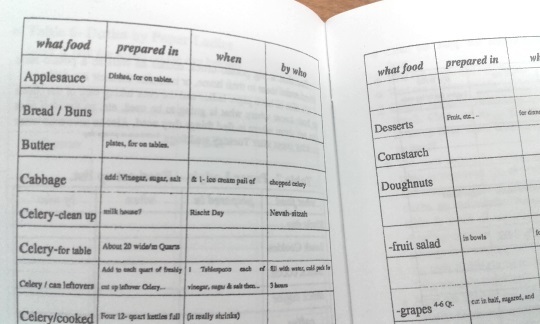 Thanks Urs, yes “A Wedding Preparation Booklet” is the English subtitle the compiler(s) gave it.